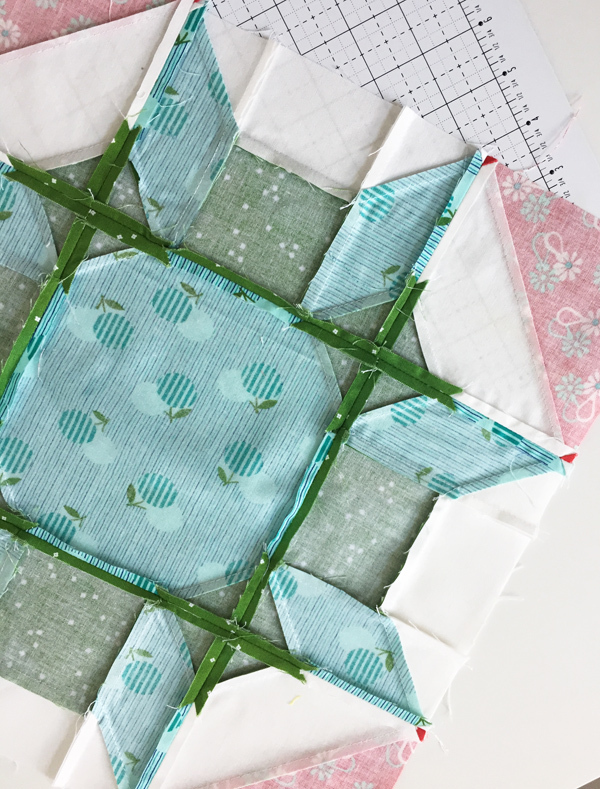 If you are sewing along with me making Shimmer blocks for the next 5 months…this post has some tips for you! If you have no idea what I’m talking about…see this post. 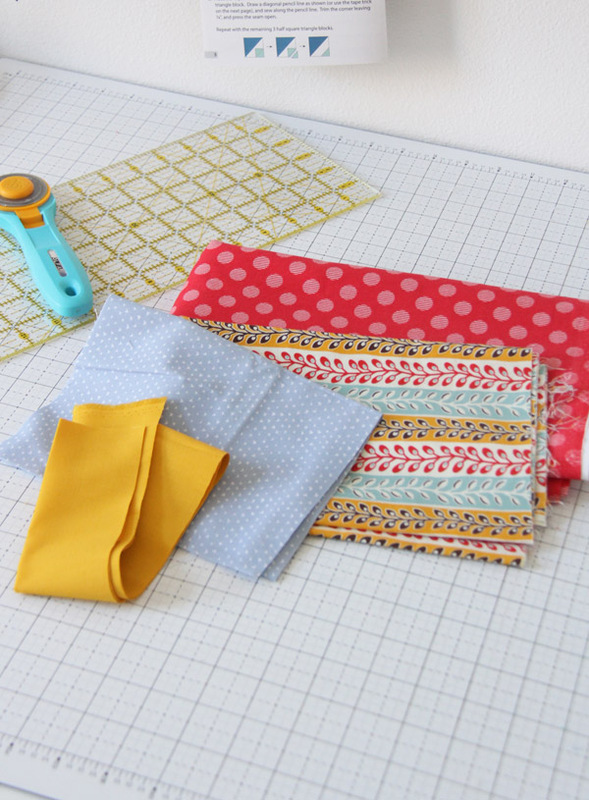 You’ll want to plan out your fabrics a bit before you get started. 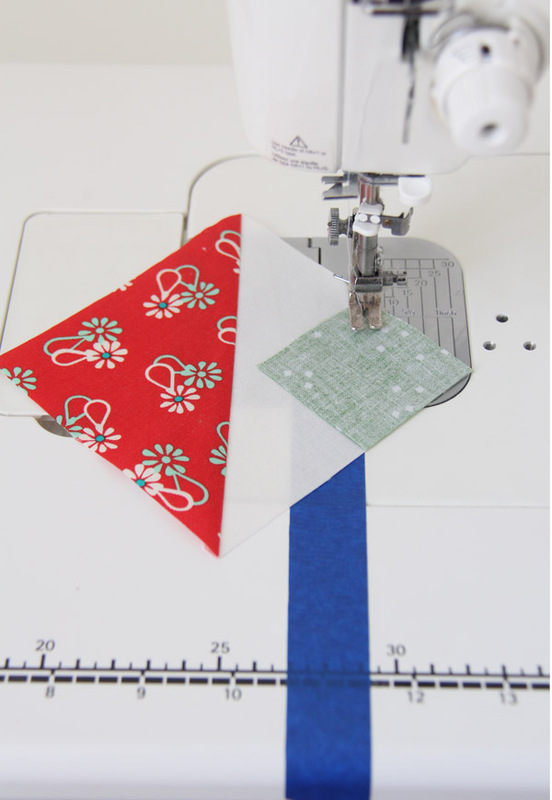 The pattern uses a background fabric, and fat quarters, so you can either cut your background and fat quarters all at once now, or you can cut your background fabric now for the whole quilt, and cut the block fabrics as you go each month. I’m doing the latter… I cut all of my background fabrics, and I’m digging through my stash each month and cutting fabrics as I go. Either way works! Also don’t feel like you need to use just 3 fabrics in your blocks…I’m using 3 or 4, I like the strip points to be a different fabric. These blocks can get really busy, so I like to choose one busy main print, and keep the other fabrics more subtle. There is lots of inspiration at the #shimmerquilt hashtag on Instagram! Painters tape is my best friend when making blocks like this. If you aren’t using an exact 4 1/2″ ruler to trim up your HST’s, placing tape along the edges to frame out the 4 1/2″ square can speed up trimming. I also use painters tape to sew on the stitch and flip corners throughout these blocks instead of marking all the diagonal pencil lines (I still mark the lines on the 5″ squares for the HST’s in step 2). Visit my post on The Tape Trick to get a better feel for my favorite trick ever. There are a lot of points in this quilt, and I don’t want you to get overly stressed about matching them all perfectly. If you are having a hard time matching them you can pin where the seams will intersect when sewn, but if they are a little off….don’t sweat it. Seriously…just don’t. This is just for fun!! Press final block seams open. There are a lot of adjacent angled seams when you sew the block rows together, and the best way to keep the block flat and less wonky is by pressing seams open. 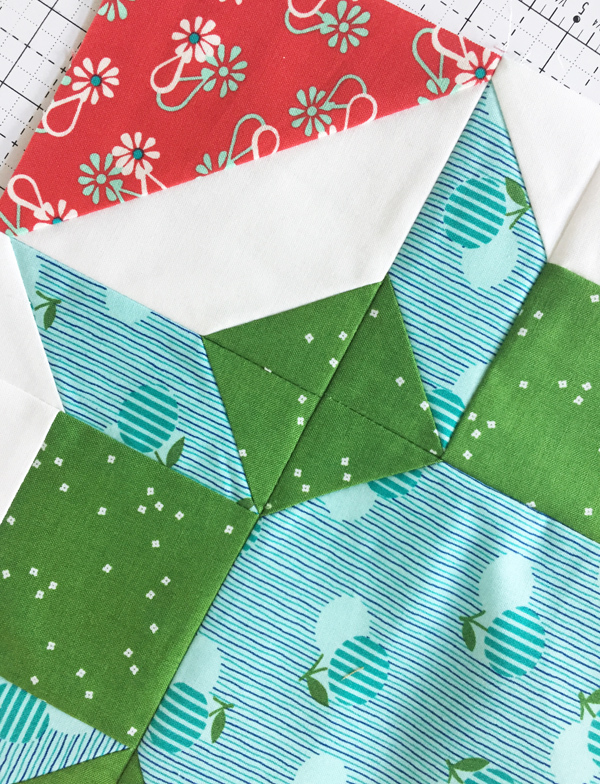 I know…pressing seams open is the worst, but you will be glad you did it with these blocks. I think that’s it! If you have any questions put them in the comments and I’ll reply there, or shoot me an email. Make 4 Shimmer blocks in February, and I’ll check back in with you the end of the month. Happy Shimmer-ing! P.S. you still want to join the us sewing Shimmer blocks the pattern is on sale here. 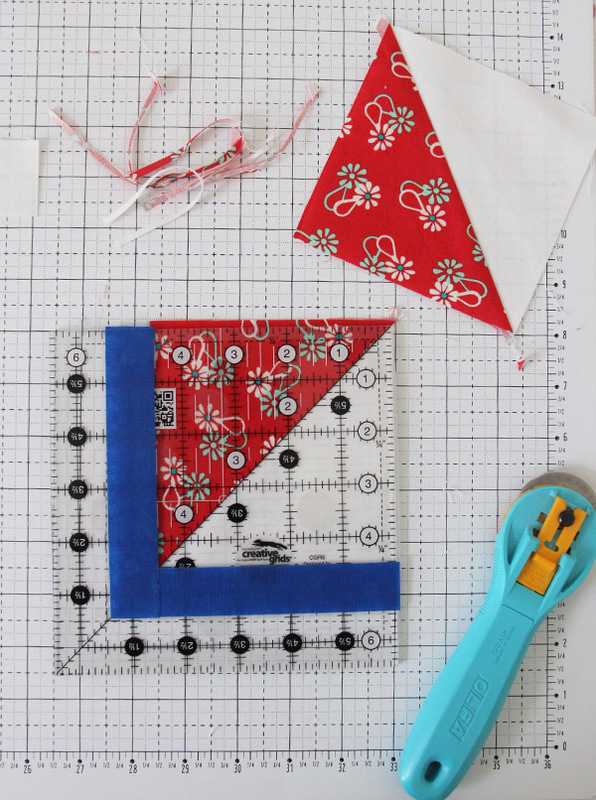 This is very low key…so no pressure and no tight deadlines, just sew 4 blocks each month starting in February an by July we’ll have 20 blocks for a Throw size (more info here). If you are on Instagram, add #shimmerquilt to your photos so we can see them! Love “The Tape Trick”! It’s one of those “now why didn’t I think of that?” LOL! Thanks for sharing, Allison! Haha it is one of the best tricks and saves so much time! This painter’s tape on the ruler trick is amazing! So simple yet it never would have occurred to me! Thanks it’s my favorite trick! I’m so excited about this block-a-long! I bought the pattern a year or two ago, and I’ve let it sit too long! Do you think Tula Pink Zuma is too busy for this pattern? No I think it would be perfect! I would just pair the busy Zuma prints with the more basic prints/solids. There are a lot of basic prints in that line and near solids, they would be beautiful with it! 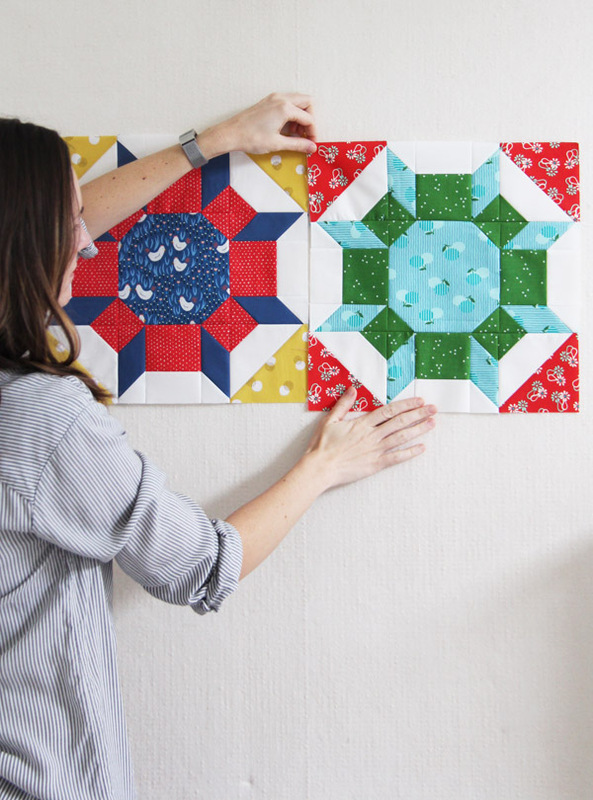 Oh my gosh, your shimmer blocks are sew cute! I love those fabrics, colors and prints! The painters tape is a good tip. Love your blocks. Great tips! I’m making mine all in blues with a white background. Waiting for my fabric to arrive. So glad to be doing this block-a-long and that you have provided cutting instructions for individual blocks. This is so much easier if I want to use a specific fabric but don’t have a full fat quarter. Love your tips! Thanks Deborah I’m glad you found the directions helpful! Yes it is! I usually do some pressed to the side within the block but the final seams are always open! I just received my pattern. So excited! How should I press the initial smaller piecing? I’m a newbie and want all the tips.